And verily a cry went out across the blog-o-verse: "Tell me of your past, Burb! What has made you so Burbalicious?" I was born on the sandy floor of a log cabin in the backwoods of Kentucky. My momma had just finished picking corn on the back forty when . . . nah. In a hole in the ground there lived a Burb. Not a nasty, dirty, wet hole, filled with the ends of worms and an oozy smell, nor yet a dry, bare sandy hole with nothing in it to sit down on or to eat: it was a Burb hole, and that means comfort. Burb was small and skinny, with brilliant green eyes and jet-black hair that was always untidy. He wore round glasses, and on his forehead was a thin, lightning-shaped scar. . . . Hmmm. Maybe? In reality, I was born in the smallish south Georgia town of Tifton. I was the fourth and last child, the third boy. You've met my siblings (at least in passing) in previous posts. MSquared is the oldest, Muleskinner was next, and my sister MA round them out. Mom and Dad both grew up in Kentucky. My dad moved to Georgia to run a research station for corn hybridization. I have mentioned the importance of corn in my familial weltanschaung. You can call me crazy if you want, but hey . . . it's my brain. What important bedrock things about my life make me who I am? Well, corn, obviously plays some kind of odd role. Another important and more trackable variable are the consequences of my birth. I was born 3 months premature and severely underweight--2 lbs., 12 oz. That sequence of numbers has always seemed somewhat mystical to me. I was not expected to live--prenatal care for preemies not being anywhere near as good in 1971 as they are today. Mom and dad baptized and confirmed me that day . . . just in case. There are pictures of me as a newborn--very small and fragile looking. I wish I could post one now, but I don't have any with me and certainly none in the digital format. I held on and eventually turned some sort of corner. I had to stay in the hospital for several months but eventually went home. As my brothers used to kid, once I got healthy I fattened up really fast. Babies in my family line have a tendency to be plump little suckers. If you ever saw Ariel or Ruth in their first year you know what I am talking about. It feels like I am really glossing over this stuff and if any of my family is reading this, they are probably thinking, "YEAH you are!" They had to listen to me complain at various points in my younger life, whining about braces and the frustration of being visibly different at an age when kids don't think twice about asking you point blank "Why do you walk funny like that?" THAT was an upsetting day . . . But I am glossing over it, because I don't remember everything. I remember vague impressions. I remember flashes of a scene. I'll have to dig through photographs to really try and recall details of that part of my formative childhood years. But it wasn't all Helen Keller struggles and traumas. Far from it. I was a bit different than most, but insanely lucky in every important way. I had a problem in the technical sense, but it didn't truly prevent me from doing anything. Maybe my therapeutic methods called attention to that technicality, but I don't think anyone ever considered me to be physically disadvantaged. This newspaper article was about Stephen and another friend of mine who had a severe car accident the summer prior to his senior year. After a lot of physical therapy Chris was able to participate in the band again by pushing Stephen's wheelchair. 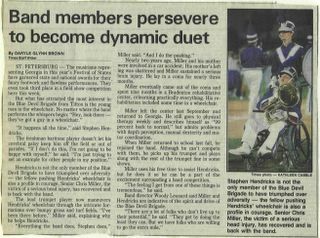 This story was written when my high school band visited St. Petersburg, FL for a multi-day music competition. Whenever I felt down about myself, all I had to do was remember that I could have EASILY been in Stephen's shoes. But I wasn't. So, I really should try and remember that I have been blessed and to take advantage of the opportunities that I can take--no matter how ordinary they might be. Because I am lucky enough to be ordinary.